The so-called "withdrawal" from Gaza is in reality only a vast media bluff, a successfull communication operation. While all cameras of the world focussed on Gaza settlers (forgetting to mention that those evacuated settlements were illegal), in West Bank colonization extended its tentacles at high speed during the same period. But the price to pay for this minimal freedom of movement (slightly enlarged cage) is high: Israel has kept total control over all borders of Gaza Strip; land borders with Israel and with Egypt (Rafah), as well as sea border and total control over Gaza aerial space. Concerning transit Israel decided that only the checkpoints of Eretz (towards Israel) and Rafah (towards Egypt) serve for persons; and all other checkpoints (Karni, Qarara, Sufa) are used only for the transit of goods. 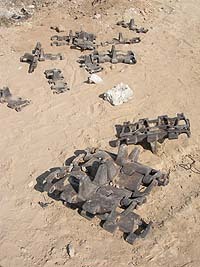 The Agreement with Europeans concerning the border with Egypt (Rafah) is just another media bluff. Indeed some Europeans Observers are present permanently at the custom office on Palestinian side, but they are only fake actors backing the fact on the ground: all data on travelers crossing this border go through the computers of israeli army before getting from them the green or red light. Israel assumes the right not only to control the movements of Palestinians, but as well of international visitors. Palestinians getting out of Gaza Strip have to ask for a preliminary autorization and they are never sure to be allowed to come back. Furthermore welcoming foreign visitors depends on israeli's goodwill. The rules in these matters are often changing (preliminary autorization required or not, working with a NGO or not, etc), and decisions are very arbitrary. 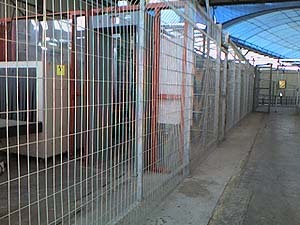 Even humanitarian workers (small NGOs as well as big organizations like ICRC or UNRWA) and diplomats sometimes have great difficulties in getting these autorizations to enter Gaza Strip and at the border they too are often subject to searchings, questioning and humiliations from the israeli soldiers at Eretz checkpoint. Moreover Rafah border being very often closed for very long periods (blockade strategy) many Palestinians are frequently stuck at the border on egyptian side (where they are not allowed to move freely) or in the no man's land separating the two customs posts. Despite "disengagement" Gaza remains a huge open-air prison. A prison without visiting right, and in addition to the control of borders, whole Palestinian daily life is under israeli total control (every official document is issued by the State of Israel: ID cards, birth certificates, and so on...). This "disengagement" that pretended to be a liberation, bears in fact the marks of a hidden but still implacable and real occupation. In addition to strongly hindering the circulation of persons, Israel controls as well totally the circulation of goods entering AND exiting Gaza Strip (Karni, al Qarara, Sufa passages), subjecting completely Palestinian economy. All Palestinian exports are subject to israeli autorizations (favouring of course products which are not competiting its own production). Moreover the slowness of customs controls, the frequent blockade of Palestinian goods for security pretexts are strongly hindering the trade from Gaza abroad. Likewise imports suffer from similar controls and frequent blockades at the borders, under security pretexts, thus provoking big increase of prices, penalizing not only the companies but as well the whole population of Gaza Strip. Since the beginning of 2nd intifada Gazan farmers and firms have been facing huge financial losses, sometimes up to bankruptcy because of these hindrances: truckloads of goods rotting at the border, lack of raw materials, impossibility to export the final products, and so on. Huge financial losses affecting not only the farmers and firm directors, but affecting the employees as well, who were already very vulnerable. 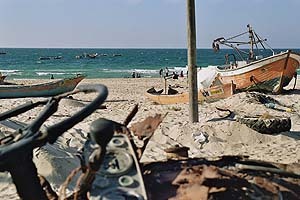 No autonomy granted to Gazans, not even economic autonomy. Subjection of entire economy aims at making Palestinians more and more dependant on the exterior, and turning them into slaves of international generosity. Refugees - in 2003 they were around 900'000 among the total of 1'300'000 inhabitants of Gaza Strip - refugees have always been the most fragile population: deprived of resources and with extremely reduced possibilities of work, piling up in overcrowded camps (Jabalyia sadly a world record of density with 120'000 persons on 2km2, in 2002). Many among them are totally dependant on international help brought by UNRWA since 1948 (naqba); whereas according to international law the occupying power SHOULD provide this support... With economical strangulation set in place for more than a decade, Israel's strategy aims at making Palestinains' life precarious and tying them up with this humiliating dependency. 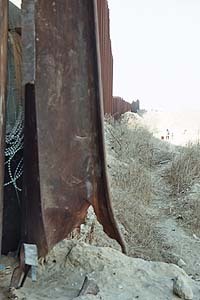 Since January 14, 2006, an infamous total blockade has been imposed by Israel, provoking shortage of basic goods (milk, flour,...) and of medications and humanitarian emergency material, with severe health consequences for the whole population; when its level of infantile malnutrition was already scandalously high. 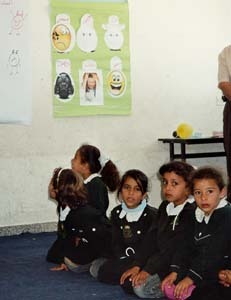 According to the report of Jean Ziegler, UN special reporter on the Right for Food, in 2003, 22% of children under the age of 5 years suffered malnutrition and 60% of Palestinians were living under the poverty treshold. These frightening statistics date back to 2003, imagine Gaza situation now after more than 6 month of blockade! Economic, health and social consequences are huge and will leave long term after-effects. Not to mention that during the whole period of siege, bombings and shellings happenend almost daily at high intensity, killing and wounding several innocent civilians (between June 25 and July 30, 2006, more than 150 civilians killed only in Gaza Strip, among them 33 children); terrorizing the weakest and imposing additional traumas onto this hungered, emprisonned and forgotten population. economic suffocation, besieging and starving the entire civil population. 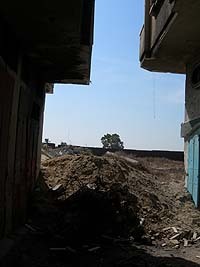 For a long time, bombings have been frequent on Gaza Strip. 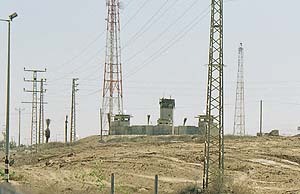 Before the "withdrawal" (August 2005), the presence of settlers on this tiny piece of land prevented the israeli army to exaggerate bombings, as the noise could disturb the settlers. But since their evacuation, the frequency and intensity of bombings have increased a lot, and as a bonus Israel could try a new terrorizing weapon: sonic boom air raids. These sonic booms are used mostly at night, terrorizing the population especially children who then suffer from sleeping disorders added to all the other heavy traumas they have been accumulating since a long time. 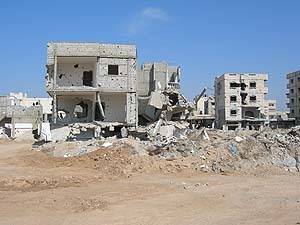 On June 28, 2006, Israel started a new large-scale attack on Gaza, allegedly to save the captured soldier, devastating in a few days many infrastructures of Gaza Strip: bridges, roads, electric power stations, ministries, and so on, depriving the population from electricity and tap water, taking in hostage several members of Parliament (democratically elected), spreading terror and death among the Palestinian civilian population already besieged since months.